The Military Affairs Association, Inc., is made up of Chamber members, but is operated under a separate corporate and dues structure. 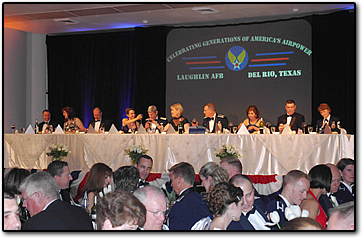 The purpose of the non-profit association is to promote goodwill between Laughlin AFB and the Community, assist in the integration of military personnel to Del Rio, coordinate efforts to strengthen current missions and assist in possible new missions, and implement measures to be taken to ensure Laughlin and Del Rio's future. Be classified as the best in A.E.T.C. Base-Community Relations. Maintain a task force that to ensure the future of Laughlin AFB and Del Rio. Coordinate efforts with military, city, county and school. Provide necessary sponsorship for VIP military when in Del Rio. Recognize outstanding military and civilian accomplishments. Provide Class Sponsors for each new pilot training class. Welcome all permanent party transfers to Laughlin and offer assistance where needed. Recruit necessary members and financial support to accomplish our combined goals.